Housing Minister Eoghan Murphy is facing a motion of no confidence in the Dáil tomorrow evening. JUNIOR FINE GAEL Minister Catherine Byrne has released a statement amid confusion as to whether or not she will support her party colleague Eoghan Murphy in a motion of no confidence tomorrow. Byrne had raised objections to a prospective housing development in her constituency of Inchicore, and reports had suggested that she would abstain during tomorrow’s vote of no confidence over Housing Minister Murphy. 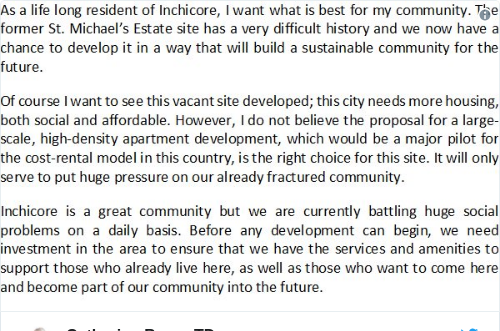 This evening Byrne has released a statement stating that she ‘of course’ wishes to see the Inchicore site developed, but that the development in question, a ‘large-scale, high-density apartment development’ in Byrne’s words, is not ‘the right choice’. “Inchicore is a great community but we are currently battling huge social problems on a daily basis,” she said. Murphy is expected to speak to Byrne before the motion tomorrow in an attempt to copperfasten her support. Speaking earlier today in New York, Taoiseach Leo Varadkar indicated that, should a government minister vote against the administration with regard to a motion of no confidence, he would have little choice but to sack them. The vote of no confidence will take place in the Dáil tomorrow evening. Today’s Irish Independent reported that Byrne told her ministerial colleagues that she is considering supporting or abstaining on the motion. Sources close to the housing minister said Byrne has not indicated her intentions to his office. Byrne recently fell out with the housing minister when she hit out against the housing plan which was announced by Murphy at a public meeting in July. Murphy defended the plans to put 470 new homes in Inchicore, but Byrne said that the plan “looked like overdevelopment” and described it as a “bad day for the community”. The plan for the regeneration of the St Michael’s Estate in Inchicore will see a new community constructed on land owned by Dublin County Council. After their disagreement was aired in such a public manner, it is understood the Murphy had a series of engagements with Byrne over the summer, with sources stating the housing minister still believes he can convince her of the merits of more affordable homes for the site. Murphy has accused Sinn Féin of “playing bad politics” and being “totally devoid of solutions” on housing and therefore the party has decided to submit a motion of no confidence in him. Sinn Féin’s motion in the housing minister is due to be voted on tomorrow evening. He added that “a credible minister” would go to Cabinet and say “we need a change of plan”. Fianna Fáil has decided to abstain on the vote, with party leader Micheál Martin stating that a motion of no confidence will not build any more homes. With the Dáil numbers tight, the Taoiseach will need every government TD in the chamber to ensure the motion is defeated. Email “'This is not the right choice' - Catherine Byrne speaks, but no word on whether she'll support Eoghan Murphy tomorrow”. Feedback on “'This is not the right choice' - Catherine Byrne speaks, but no word on whether she'll support Eoghan Murphy tomorrow”.